I’ve been on the road in Western Canada since August 4th on a project for a national Public Sector Union client. Over 18 days on the road, we interviewed 40+ rank-and-file members of the Public Service Alliance of Canada in the Prairie Region and 3 community partners representing a food bank, Canada’s largest drop in centre and an Idle No More activist. Idle No More Lethbridge/Blood Reserve activist William Singer III in an outdoor interview on his traditional land with Chief Mountain in the background. The finished three and a half minute teaser trailer that showcases the look and feel for what will be another 9 months of editing and content delivery will go live on Monday, which is Labour Day in Canada. An outdoor interview setup in Brandon, Manitoba. Our last interview for the project. In 35 degree Celsius heat. I’ll report in with the link on Monday so you folks can see what we have been up to. The new gear used on this project will also be heavily dissected in upcoming posts. 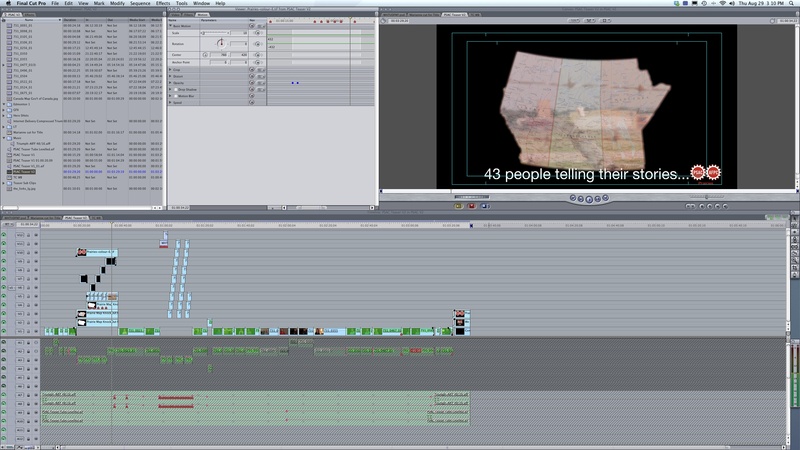 The teaser trailer Final Cut Pro timeline. Hey folks. 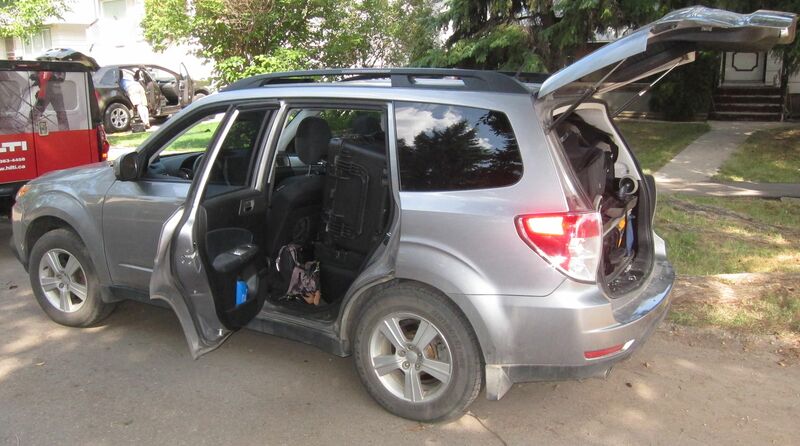 I’m on a 16 day whirlwind tour through Western Canada that has seen me pack and unpack my poor little Subaru more times than I think I have ever packed a production vehicle. 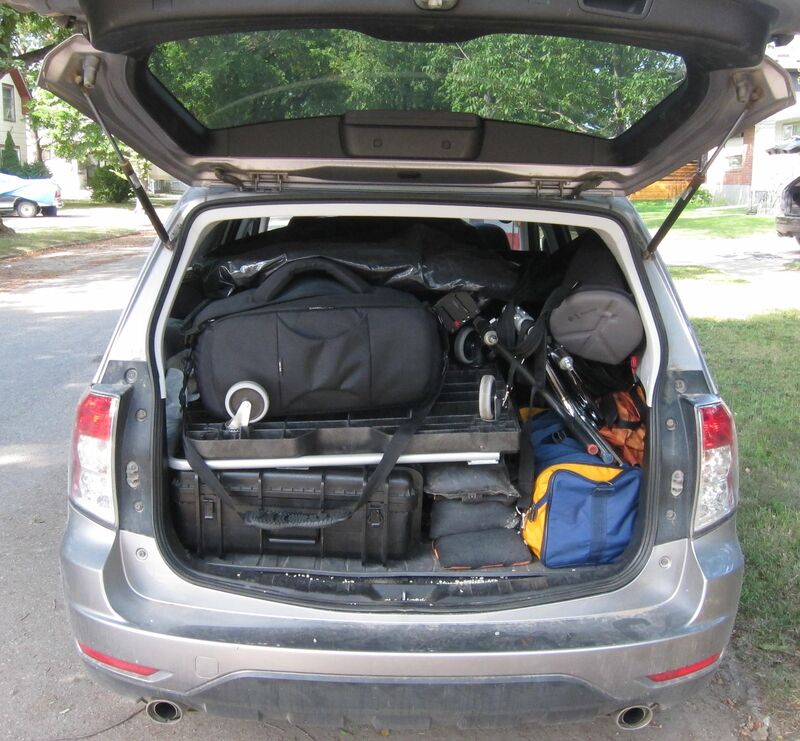 2010 Subaru Forester LOADED with video gear and studio set pieces. Three more days of shooting and then I go into edit for a piece that will debut on the Canadian Labour Day Long Weekend the first weekend of September. I may also give some pointers from lessons learned on my longest road trip in recent history that didn’t involve air travel. Forgive me for being so brief but I need to get back to backing up media cards. Right now I’m out on the road with a long time acquaintance doing a series of interviews around human rights and ethical treatment of workers. August 6th we started out in Edmonton, Alberta Canada and met some amazing people who shared stories of heartless bean-counters who announced callously that they too were experiencing fiscal restraint as they could no longer fly business class… oh, and you are all out of a job… IMMEDIATELY. Pack your things. The Calgary Skyline from Scotsman’s Hill. 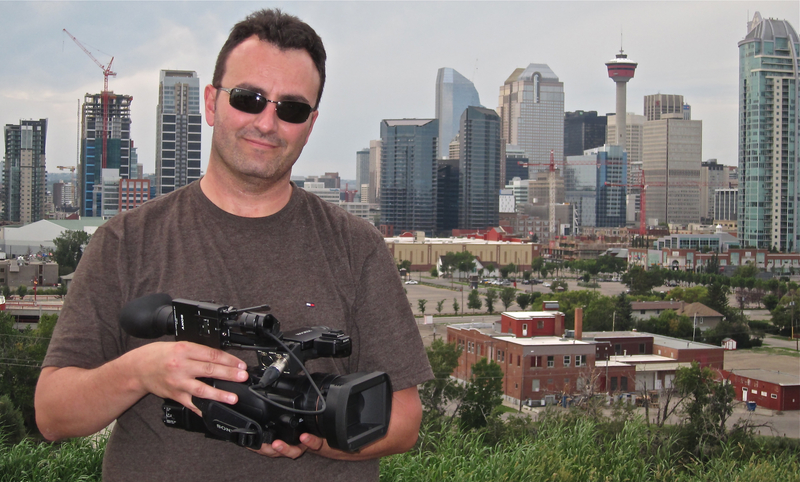 That’s me with the new Sony PMW200 XDCamEX camera we are using to shoot this project. Today, I’m in Calgary, Alberta and just got back to the hotel after a day of shooting representative footage of one of Canada’s “Boom-iest” cities after a day yesterday of talking with a tremendous fellow who is an executive at Calgary’s Drop In Centre about the realities of the working and non-working poor here who access their services. It’s great to be back on the road doing what I love to do (helping to tell the stories of incredible people). Tomorrow we pull out of Calgary, headed for Lethbridge and more amazing people. This project keeps growing organically as we discover more stories from the road. I may not see home for another month as it looks like I’ll be staying on in my old home town of Winnipeg, Manitoba to complete an edit for Labour Day in September. I’m thankful for the friends and colleagues I have who see what I bring to a project and continue to hire and refer me. Just a few short months ago I was seriously considering finding employment driving a truck or a bus as the bottom has fallen out of video production in Vancouver as I have mentioned previously in this Blog. I’m back doing the work I want to do, which can be quite polarizing – I’m a labour-friendly videographer; I help tell the stories of normal everyday people who go to work every day in search of an honest living. Sometimes they have uneventful days, sometimes they don’t. Hey folks… sort of a “cheat” here but I feel bad for not checking in earlier. I’m preparing to head out on the road for 3 – 4 weeks on a documentary-style industrial video shoot with the new tool in the shed. Actually, a COUPLE of new tools – the replacement for the venerable Sony EX1R and some interesting LED light panels. I’ll be reporting from the road and reviewing the new gear. Stay tuned, thanks for the patience and thanks for reading!